You just created an XML-port and used a Codeunit to publish your XML-port as a webservice and now you want to test to see if it works correctly. You can write a dedicated C# program, but you spend some time doing it and if your XML-port changes, you have to re-write your code again. I've done this but is not really fun to do. You can use SoapUI (http://www.soapui.org/) to test it. I did this in the beginning but it is not really easy to use and for some reason, the credentials didn't always work. Probably knowing well how to use it could solve all my problems. But it takes time and I want to have something easier. That is the reason I looked to PowerShell and I found it very easy to do. Very easy to change. How to install a webservice, creating a WSDL-file and using it in a C# project is out of scope of this HowTo. It is about using Powershell! 1 Table. This table is used to store the data we received from PowerShell. It has an auto-incrementing integer that is used as primary key. 1 Page. This page works is used to view the data we received from PowerShell. It is also possible to insert data into the table using this page. This is useful to manually create some records. 1 XML-port. This XML-port can be run stand-alone to import and export data. This is useful to export some records to a file to see the formatting of the XML. This file can then be used in the PowerShell script. 1 Codeunit. This codeunit must be published as a webservice. The codeunit has different methods to be called by PowerShell to play with it. 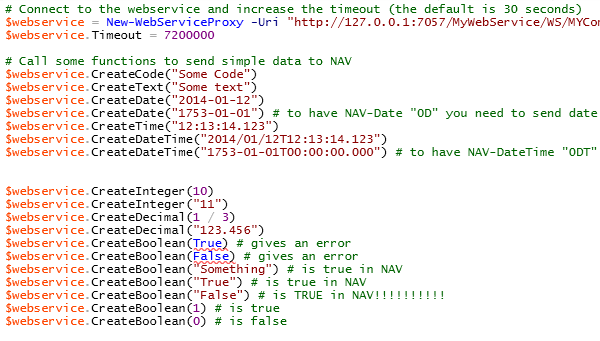 It is also possible to call the webservice WITHOUT XML-structured data. The first few functions in the codeunit are like that to have an easy start. GetSomeRandomValue (reference parameter: Text) : returns a 'random' value as a parameter. It returns 'RANDOM ' + the current datetime. GetWebServiceTestText(reference parameter : Text): returns an XML-text created by all the records in the table via the parameter. GetWebServiceTestTextReturnValue() : text: returns an XML-text created by all the records in the table via the return-value. Open the file WEBSERVICETEST.PS1 in Windows PowerShell ISE. In the file, you can run the different lines 1 by 1 and see the result in the RTC. You can also use this functionality in combination with SQL Server Agent Jobs (Or Windows Scheduler) to launch a webservice that launches certain functionalities instead of using jobqueues. I do have some customers with NAV2009R2 in which I use this system. Jobqueue is still limited to 1 function at the time. Using this system I can run multiple jobs in parallel.